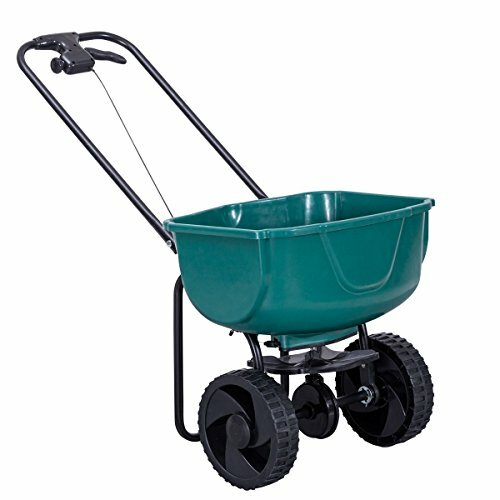 Our spreader fertilizer cart is designed to help you seed and fertilize, aiming to make your work efficient and alleviate your workload. The handles and wheels help you to move quickly and easily. The basket max weight capacity can reach 44lbs, which means it can cover about 7500sq. ft. The heavy duty steel frame and high quality plastic basket make this item durable and can serve you for along time. You can use this item in your farm, lawn, garden or your backyard for the seed, fertilizer and salt. Do not hesitate to buy one! High-Capacity---The basket max weight capacity can reach 44lbs, which means it can cover about 7500sq. ft and help you work more efficiently. Precision Operation---Features exclusive accurate plant technology that ensure plant grow well, you can use this item in your farm, lawn, garden or your backyard for the seed, fertilizer and salt. High Quality and Durable---The heavy duty steel frame and high quality plastic basket make this item durable and can serve you for long time. Simple Use----Equipped with handles and wheels help you to move quickly and easily, no operation difficulty and everybody can use it. More Efficient---Our spreader fertilizer cart is designed to help you seed and fertilize, aiming to make your work efficient and alleviate your workload.